When someone asks me why so many people, especially religious people, don’t believe what scientists tell us, it is too easy to say that people are ignorant or have one standard of evidence for soul-saving preachers and another for know-it-all scientists. There are better explanations. The products of science are impressive, powerful, and dangerous. Scientific knowledge and understanding inspires technology. It gives us the World Wide Web, smartphones, supercomputers, spacecraft, robots, and weapons of mass destruction. Our lives are easier and more connected than those of our ancestors. Progress costs us much in privacy, security, and freedom. Medical innovations such as vaccines, antibiotics, pain-killers, contraceptives, anti-depressants, MRIs and mammograms extend our lives while making us more dependent upon them as nostrums and panaceas. Genetic engineering in plants and animals is remarkable but provokes neophobia and paranoia. What if its ubiquitous use threatens natural resource sustainability? Science enables people to do immoral things. Drones and clones are scary. 2. Science defies common-sense and challenges established world-views. "Seeing is believing" but collective experience tells us not to believe everything we see. Common-sense says that whatever occurs happens for a reason, but physicists say otherwise. Modern physics finds that some events are uncaused when we can't help but think that every thing and every event has a cause. Subatomic particles can come into existence and perish by virtue of spontaneous energy fluctuations in a vacuum. Even the entire universe whose present form emerged in a cosmic explosion 13.7 billion years ago may not have had an ultimate or first cause. Some scientific models continue to suggest an eternal, cyclical, or oscillatory universe rather than a single creation event. Cosmologists say that the universe doesn't have a center and doesn't have an edge. Science progresses by upsetting and superseding old world-views. Scholars in ancient and medieval times believed Earth was the fixed center of the cosmos, that there are only as many basic, unchanging kinds of organisms as God separately created, and that there are just four elements which comprise everything: earth, air, fire, water. But the history of science is a tale of numerous rejections of old beliefs. For almost 2000 years physicians practiced blood-letting, believing that good health required the delicate balance of bodily fluids: blood, yellow bile, phlegm, and black bile. Empirical observations revealed that bloodletting killed more people than it healed. Nobody still thinks disease is caused by angry gods or evil demons. We now treat mental illness without trepanations or exorcisms. 3. Scientists make contrary and even contradictory claims. Researchers report that recent studies show low carbohydrate diets are healthier than low fat diets. If true, this contradicts established scientific findings and subsequent recommendations to reduce fats more than carbohydrates in one’s diet. They’ve reversed recommendations on salt and cholesterol intake as well. What are we supposed to believe when authorities change their minds? Mainstream reports of science often distort the significance of some research, especially conclusions based on small samples or low quality, preliminary studies. Bad science makes headlines in part due to the politics of science itself. Often a specialist in one discipline, say, a cardiothoracic surgeon with a popular television show, becomes an authority on nutrition for the general public. Beware the authoritative non-expert. Physicians get the science wrong. Some doctors are scientists but most are not. A “Referendum on Alcohol in the Practice of Medicine” prepared for the U.S. Congress in 1922 revealed that over 50% of physicians surveyed continued to prescribe “spiritus fermenti” or whisky, wine and beer as a necessary therapeutic agent for treating influenza, pneumonia, heart failure, shock, anemia, diabetes, cancer, asthma, dyspepsia, snakebite, lactation problems, and old age. So far no randomized controlled clinical trial (RCT) on even moderate alcohol consumption and mortality outcomes has been done. The medicinal benefits of alcohol have yet to be found. We must fact-check all sources of information, but when is the last time you looked at scientific literature? 4. Science is hard to do and assess, it is especially difficult for non-experts to understand. The general public cannot easily check whether what scientist's assert is true. Scientists study complex, difficult to observe phenomena. They do so by drawing finer distinctions than common-sense and ordinary language permits. Without advanced training or at least a college course in inductive reasoning or statistics, most people who acquire a scientific conclusion from non-expert, second-hand sources cannot process it competently. We like stories not statistics. Ordinary people trust personal experiences and testimony but scientists rank types of evidence differently. In science any hypothesis is incredible if it cannot be falsified by experiment (i.e. tested with the possibility of being rejected). Use science databases such as NCBI or PubMed. Do an online search with terms that narrow the field to higher quality sources, e.g. “low carbohydrate diet versus low fat diet meta-analysis randomized controlled”. 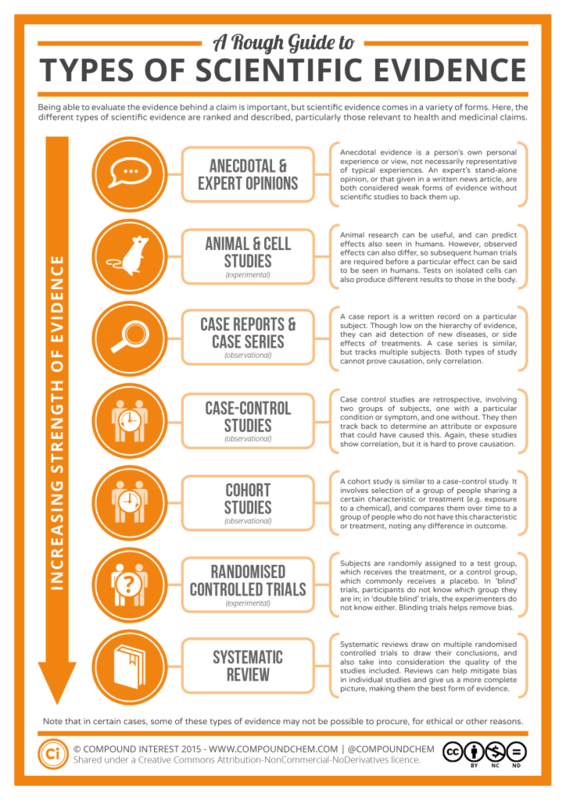 Here is rough guide to spotting bad science. Also, Trish Greenhalgh (1997) has a nice series of very short must read articles on "How To Read a Paper” that explain how to interpret different kinds of research papers. 5. Scientists doubt or reject what most people believe. Most Americans believe in supernaturals (Harris Poll, 2013). People think that supernaturals explain events, but scientists don’t. Angels visit, ghosts haunt, devils make us sin, gods make and destroy worlds. For scientists, and methodological naturalists in general, supernaturals are superfluous. This is why so many are atheists (Pew Research, 2009). Science abjures faith and demands testable evidence. Its predictions are dire. All of this alienates scientists from non-scientists. When beliefs are threatened by new facts, people grasp onto unfalsifiable justifications. Motivated reasoning and confirmation bias affects negatively our ability to evaluate scientific evidence. So when scientists tell us what we don’t want to hear we are dubious. We just don’t want to listen to people who are so negative all of the time. Scott, thanks for this informative piece. The Pew survey of scientists is interesting with respect to its findings on religious belief, specifically that traditional religious belief is higher among younger scientists than older ones. I wonder how to explain that. Also, it's interesting to note that when you go to the survey itself (rather than the document summarizing it that you've linked to) the first fact it reports is that Americans overwhelmingly admire science. And since Americans are also overwhelmingly religious, that certainly bears out your instinct to resist blaming distrust on religion. It's not just too easy, it's not even right. Randy, Yes, as I see it, distrust in science (scientists, scientific claims) is rooted in deeper predilections than religious disposition. Magical thinking, wishful thinking, and trust in one’s elders or tribal authorities are causes inter alia of people’s trusting faith-based reasoning over evidence-based reasoning. Scott, great five reasons. It is getting harder to ignore science. The farther you look into the past, the more you see how easy to was to just not think about science or understand it. Today you are under increasing pressure to be scientifically and technologically literate, and if you aren’t, then you feel threatened; you get judged poorly by employers and don’t get the good jobs. I’ve heard people say, “I want to be a nurse, but I hate science. I just want the respect and job security that nurses have.” It takes significant mental effort to understand science and technology and not to think of it magically. Because the average person in any century has been intellectually lazy, and because it is getting harder and harder to be a success and still be intellectually lazy, the percentage of people who see science as a personal threat and who hate science will continue to grow. But there might be a hopeful sign on the horizon. With great advances in artificial intelligence may come machines that can take over both the hard labor and the hard thinking. "But there might be a hopeful sign on the horizon. With great advances in artificial intelligence may come machines that can take over both the hard labor and the hard thinking." Of course, it's not clear that this is a hopeful sign for the intellectually lazy themselves, since those machines will have their jobs. In fact, lots of them already do. If the only jobs available are the ones that smart machines can't do, that's a really,really bad sign for the intellectually lazy. The intelligent machines might begin to wonder whether they need all those humans who use up valuable resources. I agree with you guys. AI machines will do the hard stuff more efficiently without all of the emotional and ethical dithering of we meatbags. And killer robots are already among us ... see "The Dawn of Killer Robots " video I posted to the dept website. Intelligent robots have the potential to work more skillfully in dangerous environments, to better perform boring tasks for us tirelessly, and to help us make better decisions. But there are negatives. When the scientists discover how to make more autonomous and agile killer robots, it will be easier for rich military and police forces to build and use them. That drone over our house will be deciding every second whether we should continue to live. The woman who won the Nobel Peace Prize for working to ban land mines has started the Campaign to Stop Killer Robots. She means autonomous robots, those that the military and police officers turn loose to fight on their own. I wish it weren’t true, but it seems to me that it will be harder to ban those robots than it has been to stop the proliferation of nuclear weapons. The longer-term problem and more dangerous problem will arise when robots become smarter than their designers and controllers. At the onset of this stage of robot evolution, the designers and controllers will try to design their robots to be good robots just as we parents try to raise our children to be good children. But we can’t force our children to be good, can we? On the positive side of all this, it seems to me that in future years we humans will start merging more and more with the machines until there is little difference between human-like machines and machine-like humans. The machines may inherit the Earth, but we may be those machines. I tend to agree with all that, though it's always good to remember that 50 years ago it was pretty obvious to everyone that by now the whole world would be nuclearly powered and that cars would fly. On the other hand, nobody had even imagined the internet. Audi just developed a carbon neutral method of creating diesel fuel from C02 and water. Someone else has figured out a way to plant forests with drones. It's just so hard to know what will actually have a large impact on the future and what won't, mostly because we just have no idea what new ideas people will have or new technologies we will develop. Yes, "we just have no idea what new ideas people will have," and even more so we just have no idea what new ideas A.I. robots will have. They definitely won't just think what humans programmed them to think. Scott, I apologize for our getting off your main subject. Scott, let’s get back to your subject of why people distrust science. I’m not going to challenge any of your wonderful five points, just comment a bit. John gets a cold, and the scientist says it is because John acquired a certain rhinovirus. John knows the scientist wants John to be satisfied with that explanation. But John isn’t satisfied. He thinks that the scientist is merely explaining how he got his cold and isn’t explaining why. John wants to know whether God gave him a cold via a rhinovirus as payback for what John did years ago. John distrusts that science can give any of the deep explanations that he, himself, is interested in. A second reason why people distrust science is that they seem to believe that scientists promote scientific values about knowledge always being wonderful while running roughshod over higher values. John thinks Fritz Haber, the father of chemical warfare, mistakenly valued knowing how to create poison gas over the value of protecting human life from poisoning. John believes Oppenheimer and his WWII research group in New Mexico made a similar values choice when they focused only on solving the interesting problem of whether an atomic bomb is scientifically feasible. Hi Brad, Yes, those are on the list of reasons why people mistrust science, both are worthy of more extensive consideration. “Why me?” people say. Bad luck is an unsatisfying answer. Our minds infer (and prefer) agency everywhere. This is Justin Barrett’s hyperactive agency detection device (HADD) idea. Maybe Aristotle’s distinctions help here. Scientists only give material causes and efficient causes, not formal or final causes. People seek formal and final causes given their tendency to think of events teleologically, as the intended ends of agents or processes with goals. Add to that our background assumption that whatever occurs must happen for a reason. Imagination and experience further fuel these biases. Sometimes a material cause (rhinovirus) and efficient cause (exposure to rhinovirus particles) is all there is. We want to blame gods or demons but we don’t need to. Why? We can explain phenomena adequately without formal and final causes. Supernatural interventions as explanations, like supernaturals, are superfluous. Hypotheses (with or without gods) that cannot be framed in such a way that they can be tested are not distinguishable from just-so ad hoc story-telling. About values: It’s undeniable that some people (scientists included) value knowledge or truth over life and happiness. Some of us want to believe and use what is true, moral consequences be damned. But it’s unfair to accuse specific scientists whom we have good reason to suspect were utilitarians desiring the greater good. Oppenheimer did not seek to destroy worlds, nevertheless, “physicists have known sin, and this is a knowledge which they cannot lose”. I find no data on whether scientists have or promote different moral values or prioritize differently values they share with non-scientists. That’s worth investigating. Applied science certainly does give us dangerous tools. Science, like religion, is a tool for good and evil, both inspire much good and much mayhem.